The most important thing to get right in business is… alignment of your team. I know that’s a bold statement, but let me explain. If you’ve ever watched a rowing team, you see how fast the team goes because everyone is rowing in exactly the same direction, at exactly the same speed. You can imagine the friction that would be caused if someone started rowing just slightly to the right, or at a completely different speed. Their rapid progress depends on complete alignment of everyone in the boat. A fast growing company is exactly the same. People are making rapid decisions on the spot, in a number of different areas. And if no one is clear on where they are headed or how fast, the momentum will be fragmented and ineffective. One of the biggest differences that separates great companies from the rest, is a clear vision that is embraced by everyone in the company. And, if you’re going to create a vision, why not create a bold vision? One that takes you to a remarkable destination and creates value that changes lives—including your team members and your clients. The challenge, though, is how to best share a vivid and crystal clear picture that everyone, even brand new team members can see. The tool that we use is called the Vivid Vision, introduced to me by Cameron Herald (formerly of 1-800-GOT-JUNK). 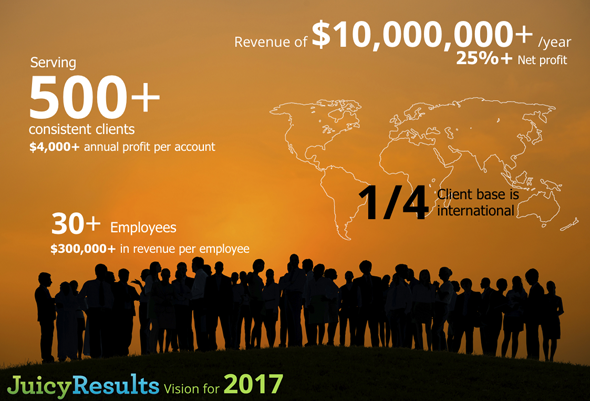 A summary of the numbers in our 2017 Vivid Vision. The Vivid Vision is a tool used by numerous fast growing companies including 1-800-GOT-JUNK, which used painted pictures to grow from a few million in revenue to over 100 million in revenue. The Vivid Vision is a detailed description of what the company looks like roughly three years from today. 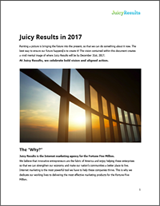 Our latest Vivid Vision details our vision of Juicy Results in 2017. You can actually help us make this vision a reality by reading this blog post about turning every client into three.